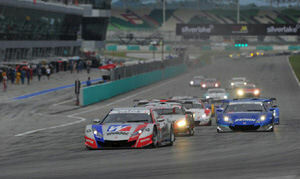 The Super GT International Series Malaysia race, Round 3 of the 2011 Autobacs Super GT series, took place at the Sepang International Circuit in Malaysia on June 19. 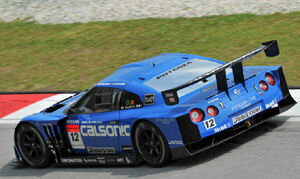 In the GT500 class, the winner was the No.1 Weider HSV-010 driven by Takashi Kogure and Loic Duval. Race day was the hottest yet in this race weekend at Sepang. By the time the formation lap started at 4 pm local time, the heat had passed its peak and the skies were increasingly cloudy, but it was still a hot 34 degrees C. with a 43-degree track surface temperature. When the official start was signaled after the formation lap, it was the pole-sitting No.1 Weider HSV-010 of Loic Duval that got the hole shot. Following Duval into the first corner were the second-place qualifier, the No.46 S Road MOLA Nissan GT-R of Ronnie Quintarelli and the No.17 KEIHIN HSV-010 of Toshihiro Kaneishi in third. Behind them, the No.12 Calsonic IMPUL GT-R driven by Joao Paulo Lima de Oliveira and the No.39 Denso SARD Lexus SC430 of Takuto Iguchi collided while running side-by-side. Both machines ran off the track as a result and dropped far back in the pack. Moving up into fourth position in their place was the No.8 Arta HSV-010 with Hideki Mutoh behind the wheel. In fifth position came the No.24 Advan KONDO GT-R of Bjorn Wirdheim and behind it a cluster of cars would begin a cramped battle for position. Meanwhile, the top two running No.1 Honda HSV-010 and No.46 Nissan GT-R managed to slip away from the pack and open up a considerable margin. Depending on the timing of their meeting back-markers after that, the gap between the two leaders would shorten and widen as these two machines alone continued to run laps in the 1'59 to 2'00 min. range. Some distance behind the two leaders there was a hot battle for third position raging from the early stages of the race. 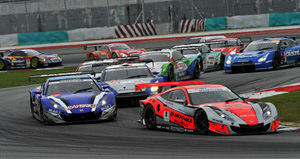 Locked in the close-quarters battle were Kaneishi in the No.17 KEIHIN Honda HSV-010 and Mutoh in the No.8 Arta Honda. Farther back, in the group running behind Wirdheim in the No.24 Advan KONDO GT-R, Takuya Izawa in the No.100 Raybrig HSV-010 emerged to try to pass No.24 on the last turn of lap six. Unfortunately the attempt failed as Izawa ran off the track and into the gravel bed. This dropped him back to last position in the GT500 class. In the battle for sixth position, the No.36 PETRONAS TOM'S SC430 of Andre Lotterer overtook the No.38 ZENT CERUMO SC430 driven by Kohei Hirate on lap nine. After that, Lotterer in the No.36 Lexus chased Wirdheim in the No.24 Nissan GT-R, but the superior speed of the GT-R on the straights prevented him from making a decisive move. Meanwhile, Lotterer had to worry about cars No.38 and the No.35 D'STATION KeePer SC430 of Andre Couto chasing just a few tenths of a second behind him.